The Toronto Transit Commission (TTC) uses buses and other vehicles for public transportation. The TTC has more than 172 bus routes in operation, and served over 487 million riders each year in 2011. Most bus routes serve the suburban areas of the city, and are tightly integrated with the subway system, with free transfers between the two systems, and most suburban subway stations equipped with bus terminals located within the fare paid area. Several routes run into Downtown Toronto, where buses are less used and the area is instead served by the TTC's streetcar system. Many TTC bus routes are divided into branch routes, which deviate slightly from the original route, or which terminate at different points along the route. As well, there are express routes which skip some stops along its route. The system is available 24 hours a day, 7 days a week, but overnight service is limited compared to regular routes. Some bus routes extend beyond the city limits into Mississauga and York Region, as those municipalities contract out bus routes to the TTC outside of Toronto. Despite almost completely being in Mississauga, Pearson International Airport is within the TTC's fare-paid zone. The Toronto Transit Commission owned over 2,000 buses in 2010, holding the third largest overall bus fleet in North America, behind the New York City Transit Authority (6,263) and the Los Angeles County Metropolitan Transportation Authority (2,911). Of these, 693 are hybrid electric vehicles, the second largest such fleet in North America. Since 2011, all buses are fully accessible (lift-equipped or low-floor) and equipped with bicycle racks. In 2009, the TTC began its first bus rapid transit service in the city, the York University Busway. The service was replaced after the Line 1 Yonge–University subway extension to Vaughan opened in December 2017, though one route still uses the busway. Bus service in Toronto began in 1849, when the first public transport system in Toronto, the Williams Omnibus Bus Line, was launched. The service began with a fleet of six horse-drawn stagecoaches. After ten years, the use of streetcars were introduced in the city as the Toronto Street Railway (TSR) was established in 1861. After a year of competition between the two companies, the TSR had surpassed Williams Omnibus Line in ridership. From 1947 to 1993, the TTC's system included several trolley bus routes, such as this one on the Weston Road route in 1987. Until 1921, several private and publicly owned transport systems were established and ended up being merged into one another or abandoned. Electric streetcars were widely used in Toronto and surrounding settlements during the new century. After the establishment of the Toronto Transportation Commission (TTC) (predecessor of the Toronto Transit Commission (also having the acronym of TTC) until 1954), streetcar routes were taken over from predecessors in 1921. It ran bus routes by using motor buses for the first time in the city. The TTC also experimented the use of trolley buses from 1922 to 1925. Gray Coach, an intercity bus line by the TTC, began operation in 1927. As the coach service increased in ridership, the TTC built the Toronto Coach Terminal. By 1933, the TTC introduced the local bus and streetcar stop design, a white pole with a red band on the top and bottom. Throughout the 1930s and 1940s, the city began replacing various street railway routes extending to surrounding municipalities with bus routes. Between 1947 and 1954, the TTC acquired new trolley buses and converted several streetcar routes to use them. A few private bus operations existed alongside the Toronto Transportation Commission, including Hollinger Bus Lines in East York (1921–1954), Danforth Bus Lines in North Toronto and King City and its subsidiaries North York Bus Lines in North York and Toronto Bus lines which operated north and east of Toronto (1926–1954), West York Coach Lines in York (1946–1954), Hollinger Bus Lines, which operated in East York and Scarborough, as well as a route to Mount Albert and Roseland Bus Lines which served York and had a route from Weston to Woodbridge (1925–1954). All services were taken over by the TTC on January 1, 1954, when it became the sole public transit operator in the newly formed Metropolitan Toronto. In 1966, plans were made to replace all streetcar routes with buses in the next 20 years. The plan was cancelled in 1972 and streetcar routes were rebuilt. Two years before the cancellation of the plan, GO Transit was established by the Government of Ontario with Gray Coach serving as its operator for most of its routes. The TTC operated its first dial-a-bus services under GO Transit in 1973. In 1975, the first paratransit service, Wheel-Trans, was established by a private operator. The TTC also began using minibuses for minor routes, which would be replaced by regular buses by 1981. A Wheel-Trans bus at York University. The paratransit service has been operated by the TTC since 1988. In 1987, the TTC implemented the Blue Night Network, an expansion of its overnight services using buses and streetcars. The following year, the TTC took over Wheel-Trans services. In 1989, the TTC began using buses fuelled by compressed natural gas (CNG). The TTC sold Gray Coach Lines to the Scotland-based Stagecoach Group in 1990, while also introducing "community buses", providing minibus service in a few residential neighbourhoods. In 1993, the TTC ceased the use of electric trolley buses. Accessibility expanded to regular buses in 1996 with the use of lift-equipped buses. This was further improvised two years later when low-floor buses were added to the fleet. The TTC experimented with hybrid electric buses during the mid-2000s. The first hybrid buses entered service in 2006, the same time CNG-fuelled buses were retired. Under the Transit City plan in 2007, the TTC announced it would introduce new bus rapid transit (BRT) routes in certain transit corridors. By 2008, the TTC increased service for 31 bus routes, and extended operating hours. In 2009, the TTC opened its first BRT route that uses its own dedicated busway and bus lanes when route 196 York University Rocket was rerouted to the York University Busway. When the extension of Line 1 to Vaughan Metropolitan Centre opened in December 2017, the 939B Finch Express is the only route continuing to use it. The TTC ordered 27 articulated buses from Nova Bus, which began revenue operation in the spring of 2014. At 18 metres (60 ft) long, as compared with a standard 40-foot bus, the Nova LFS Artics hold about 112 people, compared with 65 on the standard length bus. A TTC bus painted in livery based on the Flexity Outlook streetcars used by the TTC, 2018. The livery was introduced on TTC buses the previous year. As of December 23, 2016, all of the buses in the TTC system have Presto card readers. Buses delivered to the TTC since 2017 have a new livery based on the livery of the Flexity Outlook streetcars. The TTC is currently constructing the McNicoll bus garage near the intersection of Kennedy Road and McNicoll Avenue in northern Scarborough to increase capacity. The new building will house 250 buses within an approximately 2.6-hectare (6.4-acre) facility. The garage will feature rooftop solar panels, a green roof and a system to recycle bus wash water. It is expected to be completed in 2020. In 2018, the TTC planned to buy 30–60 battery electric buses, which would help it meet its target of an emissions-free fleet by 2040. To test the performance of electric vehicles, the TTC received three demonstration buses, one each from three electric bus manufacturers: New Flyer, BYD and Proterra. In April 2019, the TTC received the first of 60 electric buses after ordering 20 each from New Flyer, BYD and Proterra. The buses are powered exclusively with lithium-ion batteries and are expected to travel about 250 kilometres on a single charge. Per year, each electric bus will reduce CO2 emissions by 149.2 metric tons (146.8 long tons; 164.5 short tons) and eliminate diesel fuel costs of $56,000. The 60 buses, plus infrastructure changes at three TTC garages, will cost approximately $140 million with the federal government paying $65 million of that cost. The TTC expects to put the first electric bus into service in June 2019. A TTC bus operating on TTC Route 300B. Blue Night routes are numbered from 300 to 399. There are over 172 bus routes, not including branches, that span a total length of 6,934.1 kilometres (4,308.6 mi). Some routes also have an express branch. Other types of bus routes include express routes termed "rockets" (180–199), downtown premium express buses (140–149), overnight Blue Night Network bus service (300–399), community bus routes (400–499), and express routes (900–999). A route is referred to by its route number and/or name (for example, 115 Silver Hills). Routes are named after the street or area it serves. All of the TTC's regular routes, except for 99 Arrow Road, 171 Mt. Dennis and 176 Mimico GO, connect to a subway station. Vaughan Metropolitan Centre, Highway 407, and Chester stations do not have any connections to regular daytime TTC bus routes. Prior to the 1980s, the bus shelters on TTC routes were installed and maintained by the TTC and the various municipalities of Metropolitan Toronto lacked advertising. Shelters and related advertising displays had been installed by Trans Ad and later by Outfront Media (formerly CBS Outdoor, Mediacom and TDI). Outfront Media is responsible for all other forms of non-electronic advertising on the TTC. All TTC buses, excepting the Wheel-Trans vehicles, are equipped with bike racks. In the summer of 2005, the TTC began a pilot project to test bicycle racks on five select routes as a way to boost ridership and to be more environmentally friendly. The folding racks are installed on the front of the bus and can hold two bikes. In the event that both slots at the front of the bus are full, bicycles are allowed to be put inside buses after rush hour periods only. Bike racks were tested at Wilson garage during 2005 and 2006 using the Orion V, VI and later VII bus models. 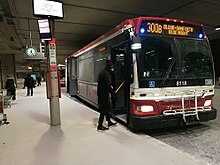 TTC staff concluded that the pilot project was not a success and that it should be discontinued, but the Commission disagreed, and voted to not only continue it, but to direct that bike racks would be installed on all new buses starting in 2007. The Commission then directed staff to look into the cost of retrofitting the entire bus fleet with bike racks. The original bike rack model will not be used on newer buses, due to it blocking the high beams on the Orion VII, and a different model from the same manufacturer will be used starting on 2007 deliveries. None of this was included in the five-year capital budget. The new Nova Bus LFS articulated buses came factory-equipped with bike racks, as do the non-articulated LFS buses entering service in 2015. These racks were sealed in October 2014 by order of the Ministry of Labour, due to concerns about bikes on the racks obscuring the drivers' view. In May 2015, the slot closer to the bus was authorised for use. The other is sealed off with metal panels, and the retention hooks have been removed. Once the first slot is full, cyclists may bring their bikes inside the articulated bus during off-peak hours at the driver's discretion. ^ "Record ridership projected for 2011 budget – TTC staff recommend 10-cent fare increase, service reallocation". Toronto Transit Commission. Retrieved 30 July 2012. ^ "Transit History of Toronto, Ontario". umanitoba.ca. Retrieved 18 January 2017. ^ "Milestones". ttc.ca. Retrieved 18 January 2017. ^ "A History of the TTC's Community Bus Services (400 series routes) – Transit Toronto – Content". toronto.on.ca. Retrieved 18 January 2017. ^ "Board Meetings" (PDF). ttc.ca. Archived from the original (PDF) on 7 August 2011. Retrieved 18 January 2017. ^ "TTC adds buses – Toronto Star". thestar.com. Retrieved 18 January 2017. ^ "No new lines, but some GTA transit improvements on track this year – Toronto Star". thestar.com. Retrieved 18 January 2017. ^ "PRESTO fare card system now operating across the TTC". Global News. ^ "McNicoll Bus Garage". ttc.ca. Retrieved 18 January 2017. ^ "TTC Green Initiatives". Toronto Transit Commission. Retrieved 2 December 2018. ^ "New McNicoll Bus Garage Public Open House" (PDF). ^ Spurr, Ben (April 20, 2018). "TTC tests battery-powered buses as it gears up for a green future". Retrieved 26 March 2019. ^ Jones, Alexandra (April 16, 2019). "TTC receives first battery-powered, zero-emissions bus". Toronto Star. Retrieved April 16, 2019. ^ a b "Mediacom buys Urban Outdoor, retires brand". Strategy News. 24 April 2000. Retrieved 26 October 2015. Toronto-based Urban Outdoor Trans Ad has been absorbed by Mediacom. The sale comes just six months after Urban Outdoor suffered a crippling blow, losing the $75-million Toronto Transit Commission contract – the largest such concession in Canada – to Transportation Displays Inc. (TDI) of New York. ^ "Bicycles". ttc.ca. Retrieved 18 January 2017. ^ "TTC working to resolve bike rack concerns following Ministry of Labour order". ttc.ca. Retrieved 18 January 2017. ^ "TTC bike rack changes to buses". ttc.ca. Retrieved 18 January 2017.